The first Wastelands anthology, released back in 2008 was widely regarded as not only a fine collection of apocalyptic tales but one of the finest anthologies full stop. Big shoes to fill then. The Editor John Joseph Adams is clearly up to the task though and has managed to get together some of the most talented authors to pen tales concerning worldwide disaster. 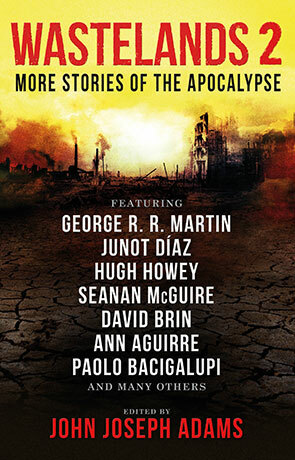 Included in Wastelands Two is thirty of the finest post-apocalyptic shorts from authors Lauren Beukes, Paolo Bacigalupi, Seanan NcGuire, Hugh Howey, Jack McDevitt, Ruddy Rucker & Bruce Sterling, Cory Doctorow, Robert Silverberg, David Brin and George RR Martin (amongst others). It's no secret that I love post-apocalyptic fiction, it appeals to me in many different ways — not least because at times the world seems to be heading that way. Wastelands Two caters for most world-shattering scenarios you could possibly imagine (and a few you probably can't). It's a diverse and somewhat eclectic mix of authors and styles with thirty different ways the Earth could get screwed for our survival. My favorites include: Cory Doctorow's Beat me Daddy (Eight to the bar) — a music themed story about a band playing music for the few survivors of a cataclysmic war. David Brin's The Postman — which acts as a prelude to the authors award winning novel of the same name (the basis for the film starring Kevin Costner, a much under-rated film). Colliding Branes by Ruddy Rucker and Bruce Sterling (first published in Asimov's Science Fiction magazine back in 2009) which follows two bloggers on the night before the universe is about to go through an ekpyrotic cycle and begin again. Although the title explains the result of the apocalypse, the story doesn't have any mentions of cyclic cosmological models - but its nice to see authors at least mention it and its a good story none-the-less. The only real downside to the book is that it includes a story by Orson Scott Card, an author who I personally can't abide, but that story is easily skipped. It's as good an Anthology as the original Wastelands (despite the appearance of Card), which makes it one of the best post-apocalyptic anthologies you will find this side of the big crunch. Written on 28th April 2015 by Ant.